I don't think of myself as a creative person and I struggle with mess. So doing craft activities with my kids doesn't come naturally. But what I am good at is 'bookish play'. No mess, no fuss, and books at the centre of the activities. 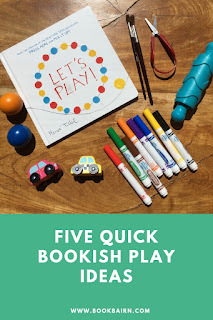 So here are five quick, and almost mess-free ideas, for ways we celebrate books in our play. We are starting this week of brilliant bookish play by just playing with our books. No set-up, just a basket of books and a kiddo who loves to turn pages, and at the end a wonderful book mess We call this baby-led reading - just let them grab what the fancy and deal with the aftermath later. It’s my best tip for raising a bookworm. Make sure the books are easily accessible and pop them down to play beside them! This is the simplest and purest bookish play I can think of! I don’t enjoy watching the colours get smudged into that delightful shade of brown that kids inevitably turn the paint colours into. But in the interest of learning about colours, I’d put my aversion aside and let BookBairn go wild with her mixing skills (with a little help and encouragement and lots and lots of learning chat from me!). 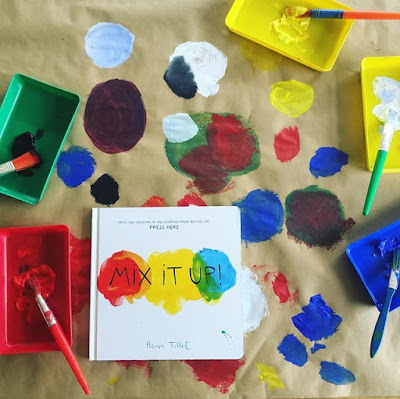 And of course the perfect book pairing is Mix It Up by Herve Tullet Such a wonderful book, that if you don’t like mess or that smudgy brown you can have similar colour mixing fun! Play dough, cupcake cases and candles and voila you have cake! 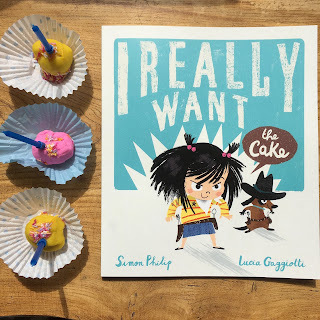 I love this laugh out loud story about a little girl who just ant resist the cake! And then she has to try and make another one. BookBairn loves play dough so this activity is always a hit and keeps her busy baking for hours! Even more fun when we make the dough ourselves to begin with and then pop it in the play oven. Making Paper Dolls is so much fun! And this lovely book will have you feeling all the feels! In other words it will totally make you cry! But it's so sweet. And a great one to pair up with this little doll sticker set from Flying Tiger as it’s super easy to do - just fold the dolls out and create fun faces and outfits with the stickers! This is a great wee set and would be perfect for travelling or out and about. And has me inspired to make some more paper dolls with BookBairn. 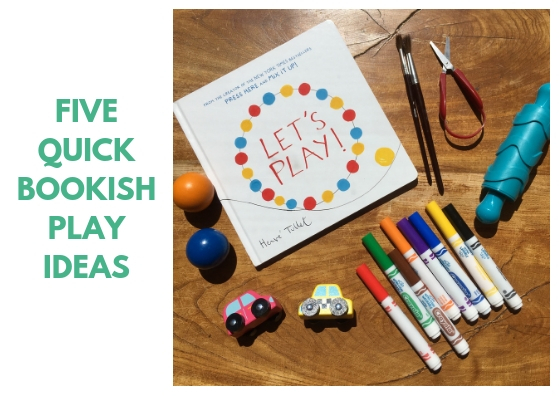 Hope you have picked up some fun bookish play ideas! Disclaimer: We were sent some of these books free for review purposes by the publishers. Words and opinions are my own. If you click on the title or image of the book you will be sent to amazon.co.uk using an affiliate link. This means that if you choose to purchase on amazon.co.uk, I will receive a small sum (around 20-70p per book) from amazon at no extra cost to you. I understand that you may not want to use an affiliate link, but if you like reading our blog please just think of it as a small tip for a tip-off to an awesome book. And know that your support means I can buy more books! For more information check out our 'For Our Readers' section. Lots of good ideas and I’ve seen most of them in action. You could probably write your own bookish play blog post!